Dead battery. More on that soon. It has been awhile since I wrote about my OReGO adventure. That is because the SUV with the monitoring device has been parked. As I mentioned in my first OReGO trail article here, I don't drive the SUV all that often; most of the time it sits unused. The SUV has been unused since the big trip. Well, today I went out to try to move the SUV to load it for our final camping trip of the year. Fall colors in Chiloquin, Oregon. Photo by Vikas Sharma. The SUV had a dead battery. 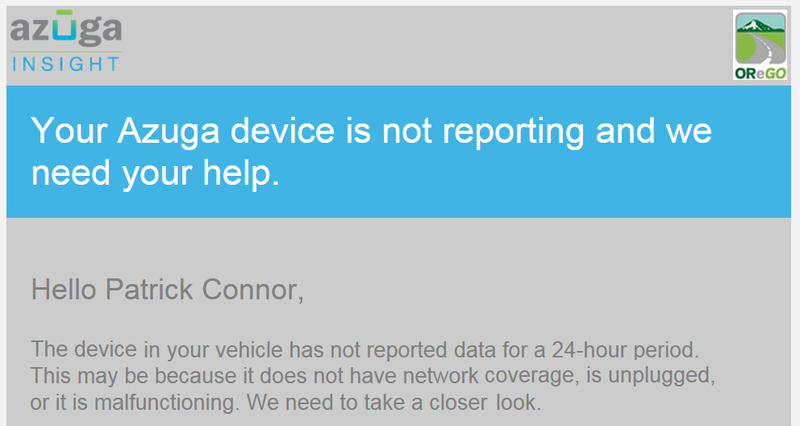 The monitoring device in the car for OReGO reports back at least every 24 hours, even when the vehicle is not being driven. So standing in the rain this morning, we tried to jump start it with no luck. So I pulled the battery out and put it on a charger in my garage. Hopefully it will charge up in time for the camping trip, if not I'll be dropping $100 for a new battery tomorrow. There were signs that there might be trouble. Back on September 7th, I received the below message from OReGO. I assumed this notice was because I had not driven the vehicle for 4 weeks. 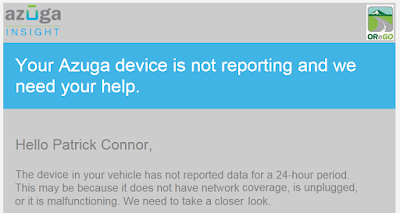 Apparently, I received this notice because the vehicle battery was dieing and the monitoring device was unable to operate. I could not find anything in the FAQ about this. There is nothing about "Null Mileage Days" or "Dead Battery" there. I'll send them an email and see what they say. It is ironic that the monitoring device is the likely cause of the dead battery and now I might be charged additionally fees because of the dead battery. After this camping trip, the SUV will again sit unused until we have a snow day or head up to the mountain to ski (likely in February). So I need some way for the monitoring device to not kill my battery again. Other than leaving a trickle charger on the battery, I'm not sure how I prevent this. I normally park the SUV in the street and it would not be easy to keep a trickle charger on it there. Since this is a voluntary program, I might have to opt out if they insist on charging me for excessive null days. I'll let you know how they respond to these concerns. If they want to roll this program out to thousands of people, they'll need answers to these real life corner cases.